The once thought to be dead 'Hellboy' franchise has risen from the grave. The next film is an R-rated reboot starring 'Stranger Things' David Harbour as the big red demon and directed by 'Game of Thrones' Neil Marshall for Millennium. Surprisingly, creator Mike Mignola took to Facebook with the announcement minutes before reports from the trades hit online. Much to the chagrin of fans who made Hellboy (2004) and Hellboy II: The Golden Army (2008) modest box office hits into a cult favorite, the original cast and director won't be back. Despite fruitless efforts to get the third installment made from original director and co-writer Guillermo Del Toro with star Ron Perlman will not return. 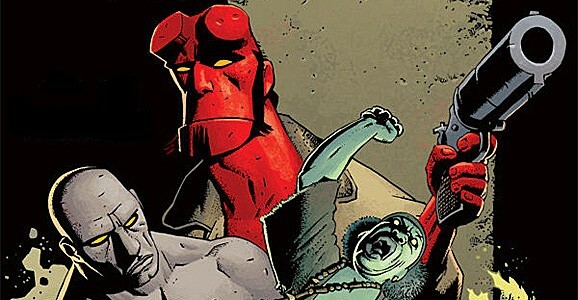 Harbour (Suicide Squad) will don the red prosthetics and Marshall (The Descent) will helm the new film tentatively titled Hellboy: Rise of the Blood Queen from a script by Andrew Cosby, Christopher Golden, and Mignola. Created in 1993 by Mignola, Hellboy became an indie fave appearing in various volumes, one-shots, crossovers and spawning numerous spin-offs. The story of a well-meaning demon who was summoned from Hell to Earth as an infant demon by Nazi occultists was discovered by the Allied Forces and raised by Professor Trevor Bruttenholm. He formed the United States Bureau for Paranormal Research and Defense (BPRD). Hellboy grew to be a large, red-skinned man with a tail, horns (which he files off, leaving behind the signature circular stumps on his forehead), cloven hooves for feet, and an oversized right hand made of stone. Hellboy works for the BPRD fighting against dark forces. No dates for production or release have been announced yet.